I shall fear no evil, for I will destroy them with my plasma sniper rifle…. I downed a Battleship class UFO, these are big and the crews are heavy hitters. I’ve been levelling a crew of new troops, trying especially for a new sniper and a new support troop, while I recruit and test looking for psi active troops. This meant I sent a pretty underskilled response team into this UFO. The biggest problem with the low skilled teams is that even though they are heavily armed and armoured, they miss more often. This is the main reason that as my section of 4 (I’d already lost a man – stabilised awaiting medivac and my drone) approached the bridge of the ship and the Ethereal alien (and his guard) there that they were whittled down to one sniper in the exchange. He was left facing two full strength Muton Elite. And there were hints of another group of aliens elsewhere in the ship that would need to be cleared. One Squaddie, with the plasma sniper rifle, a standard issue sidearm and a single grenade. In his favour is that he had good cover for the moment, and if he could use his main weapon he could inflict serious damage. But the restrictions on his weapon meant that to fire it, he couldn’t move that turn. Taking cover behind a bulkhead he forced the enemy to come around the corner to shoot him, but several turns passed without them appearing. He threw his last grenade over the damaged wall injuring one Muton that was covering on the other side. With one location identified, he sprinted across the opening to cover on the other side, taking fire from the second Muton. Now he knew where they both were. 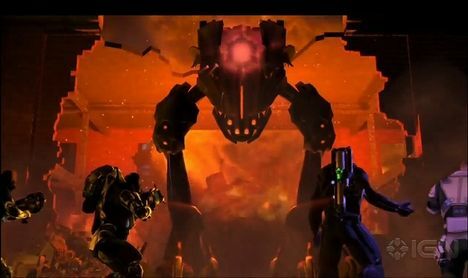 In a fine show of courage under fire, taking fire from the two Mutons, the sniper calmly reduced his opposition to zero, his Titan Armour Suit absorbing the enemy’s fire in at least one exchange. Switching to his pistol so he could fire and move the sniper cleared to the forward of the ship, the whole time haunted by enemy sounds far in the rear of the ship. Reaching the front of the ship and no aliens found, the sniper turned around and stalked slowly through the shadows of the vessel for the remaining alien defenders. He did have to kick himself for leaving his plasma pistol at the base, stuck with his normal sidearm. Near the front of the ship he froze. Ahead was the unmistakable sight of a Sectopod and Drone. He damaged the drone before withdrawing, hoping that he could draw the Sectopod into the fire of his rifle. The drone followed immediately and another pistol shot saw it destroyed. The advantage of killing the drone first is that it will repair the Sectopod if left alive. The sniper climbed to higher ground but found himself in the line of fire from the Sectopod so he immediately dropped to safety down the other side of the pillar. The Sectopod would have to take a longer path to approach him. However the Sectopod has an indirect area attack so just waiting would be suicidal. There was only one thing to do now – he must take cover in direct sight of the hulking menace in order to kill it. 3 shots later and the Sectopod’s main cannon exploded destroying it. An epic solo effort that deserved far more than a simple promotion from SQUADDIE to CORPORAL. With three members dead, one critcally wounded and our drone destroyed the price of victory, as epic as it was, is too high. The temporal gods will realign the cosmos and the mission will be rerun. But SQ Matsumoto’s efforts will be remembered. Next Next post: A finished game?? ?